Produktinformationen "Korean History: Discovery of Its Characteristics and Development"
Japanese colonialism robbed Korea of its opportunity to modernize by its own volition. Imperial Japan also propagated a false image of Korea to the outside world from the moment it went to the war against Russia in 1904. Claiming that Korea was a source of calamity in East Asia, the Japanese insisted that their occupation of Korea was inevitable and justifiable. While the Japanese buried Korea's achievements of self-modernization prior to the Russo-Japanese War, they sustained the false idea of Korean incapacity by negatively representing Korean history and racial characteristics. Japan forced annexation of Korea brought about not only distress to the lives of Koreans but also serious distortions of Korean history. Since the Liberation of 1945, Korean historians have spent much time restoring the true history of Korea while criticizing Japanese colonialist historiography. However, recovering losses already incurred during the forty years of Japanese forced occupation proved to be extremely difficult. Subsequent unstable political situations such as ideological conflict, national division, war, poverty, and dictatorship made consistent academic activity nearly unsustainable. Stable academic activity in Korea did not settle into place until the late 1960s, when Korean studies began to grow and expand. Many articles in this volume, written in the 1970s and later, would not have been possible without that initial boom. Korean historians, however, are still not free from the concept that their first task is to overcome Japanese colonialist history. Japan damaged and distorted Korea's history to such a serious extent that it was virtually impossible for scholars to construct a true image of Korea. Moreover, Western scholars made this task even more difficult as they followed in the footsteps of Japanese colonialist historians. Considering all these obstacles, achievements in the field of Korean history over the past 30 years have been quite remarkable. This volume, Korean History: Discovery of Its Characteristics and Developments, presents 29 original articles carefully selected from the Korea Journal that cover all periods of Korean history. The articles, spanning various fields and chosen under the guidance of Professor Yi Tae-Jin, are arranged into five major periods: 1) Ancient, 2) Goryeo (First Medieval), 3) Joseon (Second Medieval), 4) Modern, and 5) Colonial and Post-Liberation. 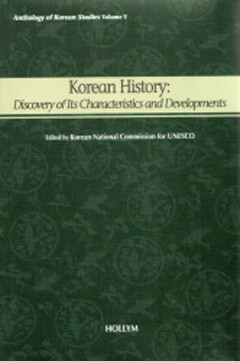 Though the compilation aims to cover a wide range of fields within each period, it should be noted that the articles published in the Korea Journal were originally limited in number and subject. Therefore, it cannot be said that this selection covers all necessary aspects of Korean history presently reflected in the advanced level of current Korean historiography. There are myriad of interesting and important articles worthy of being introduced to Western academic societies through English translation. Still, this volume serves as a display of the endeavors of Korean historians to correct the distorted image of Korean history, and is also meant to encourage and promote the English translation of a more comprehensive surveys of Korean history. · Yi, Tae-jin. Was Korea Really a 'Hermit Nation'? Weiterführende Links zu "Korean History: Discovery of Its Characteristics and Development"
Unser Kommentar zu "Korean History: Discovery of Its Characteristics and Development"
Kundenbewertungen für "Korean History: Discovery of Its Characteristics and Development"